As cheesy as it sounds, you guys have given me one of the best Christmas presents this year since there are now over 1000 of you following along with my blog on Bloglovin'! I honestly never thought my blog would grow this much over the past 18 months and I'm so thankful for the support I get from you guys and all the relationships I've built up with readers, other bloggers and brands. I haven't been able to blog as much as I'd have liked over the past couple of months, but I'm working out a schedule for the new year so you should be seeing more regular posts from me! 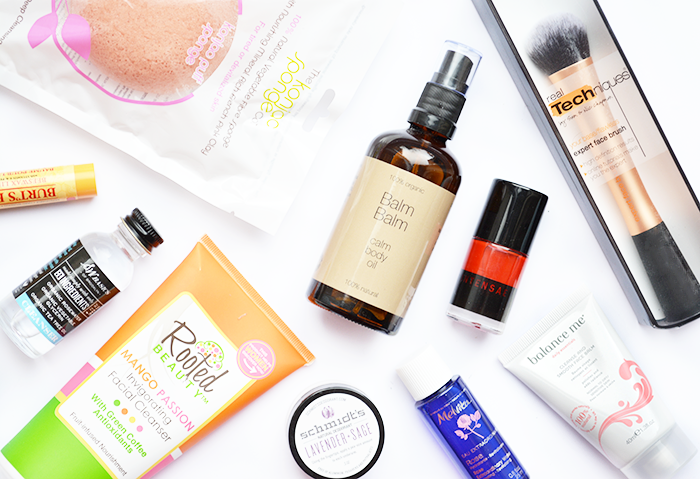 Christmas is the perfect time to give back to you guys and say thank you for all your amazing support, so I've gathered a selection of natural beauty products worth over £80 to give away to one lucky reader! THE PRIZES: full sized Balm Balm Calm Body Oil, INTENSAE Marnie Nail Lacquer, Real Techniques Expert Face Brush, Burts Bees Lip Balm, Rooted Beauty Mango Passion Cleanser & a Pink Clay Konjac Sponge, mini travel sizes of Balance Me Cleanse and Smooth Balm, Melvita Rose Extraordinary Water, Schmidt's Lavender + Sage Deodorant, SW Basics Cleanser, plus a selection of samples! What a lovely giveaway! Such lovely prizes. Happy Christmas! Your blog is one of the first I followed so thank you!! My favourite product this year is probably Lush's Let The Good Times Roll cleanser as it smells lovely and make my skin feel nice. Congratulations! It's been so wonderful to see the green beauty community to grow and I've enjoyed reading each new post of your's. This is a lovely giveaway thank you! You deserve every one of those followers, my lovely! I'm so glad we found each other through blogging - I think yours is the only beauty blog that I ALWAYS read now! Haha. I have no idea what my favourite beauty product was this year. I've barely tried anything new! Thank you for this amazing giveaway! My favourite product atm is my DIY body sugar scrub with coconut oil and grapefruit and peppermint essentail oils, so lush! I've enjoyed using Ren's BB cream, so easy and quick to use. Congrats on all the followers - you deserve them! My fave product this year would have to be the Acure shampoo I reviewed; it just made such a difference to my hair. & congratulations on your 1k followers! I've love Cliniques tinted moisturiser with SPF! It has light for during the Summer and it has kept e glowing and moisturised during the Winter too. Raw, organic coconut oil. It's great for hair, skin and even cooking (talk about 'multi-tasking) and it only costs around £8 a large jar-great stuff. No. 7 concealer, which I discovered earlier this year. Great consistency and perfect for hiding the "bags" over Christmas! I was given Bumble & Bumble shampoo and conditioner for my birthday this year, and it was lovely. My hair felt so soft and silky, I just wish I could afford this product all the time. Neal's Yard Frankincense Face Cream, it really is amazing! Liz Earle cleanse and Polish, brilliant stuff, not new I know, but new to me. Hi and congrats! Using Witch skin clearing primer under my makeup on my problem areas has reduced my breakouts! Neals yard honey and orange face scrub. Leaves my skin so soft I don't need to moisturise afterwards! Oh, I think it's probably my Konjac sponge. Or coconut oil because it's basically magic. I have rediscovered Burts Bees products. I love my lip balm.